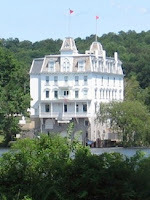 In The Spotlight, Inc.: Happy Anniversary Goodspeed! Not a lot of marriages reach their Golden Anniversary. 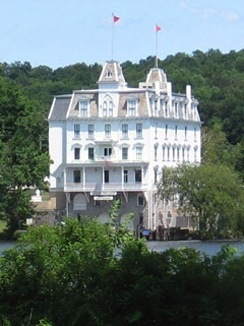 Yet, Goodspeed Opera House celebrates its happy “marriage” to its audiences of the past 50 years. This picturesque, large, white building – atypical in shape to any other theatre that I have seen – whose home is the little town of East Haddam, CT is the benchmark for superb musicals in this county. While many might disagree with me, and I admit that I don’t frequent Broadway as often as I should, Goodspeed’s work is comparable in production quality, actors’ skills, and pit orchestra talents to The Big Apple. Add the amenities of ferry boats on the Connecticut River, a pristine landscape, and a lush red staircase upstairs leading to the stage and Goodspeed has its own charm that NYC cannot offer. I have just finished reading “Achieving the Impossible Dream – Goodspeed Musicals at 50,” a softcover, coffee table book of the history and photos of this prominent theatre. The title comes from the song “The Impossible Dream,” which is the showstopper of “Man of La Mancha.” Let’s credit Goodspeed with premiering one of my favorite musicals. Other shows were launched here; i.e. “Something’s Afoot” and “Shenandoah.” Then, of course, there’s “Annie” in 1976. Because our family vacationed nearby, my parents had attended some Goodspeed’s shows. However, it wasn’t until I was an adult that I had the opportunity to go. “Swinging on a Star” was my orientation in 1995 to what was to be followed by the consistently best Broadway-quality musicals that I have seen. In 1996, I saw “Paper Moon,” based on the movie. I can’t believe that this poignant and funny story did not land, at the very least, on Off-Broadway. 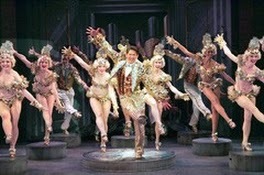 In succession, I enjoyed a variety of frothy musicals, none of which I had never heard of: “Lucky in the Rain,” “On the 20th Century,” “Babes in Arms,” “Me and My Girl,” and “Where’s Charley?” Each one was delightful, with fine singers, bright costumes, fabulous dancers, and impetus for me to return year after year. More and more, I was especially in awe of the creative choreography on Goodspeed’s postage-sized stage. Then came “Seven Brides for Seven Brothers.” How could they ever fit seven brides, seven brothers, seven suitors, and several townsfolk exuberantly dancing up a storm without at least a few dancers falling off the stage and breaking body parts? No one fell. It was a “wow moment.” “Brides” went on the books as my favorite Goodspeed musical – that is, until two years later when “Singin’in the Rain” trumped “Brides.” Maybe I am fickle, or maybe it’s the fact that Goodspeed consistently mounts better and a better production, if that is even possible. Who knows, “The Most Happy Fella” (which I will see in September) could supplant my prior favorites. It’s not impossible – it’s very possible.